Forum Index > Historical Arms Talk > Help Identifying A Sword? Posted: Wed 08 Dec, 2010 1:03 am Post subject: Help Identifying A Sword? I was hoping someone here would be able to help me figure out just what this sword (saber?) is. 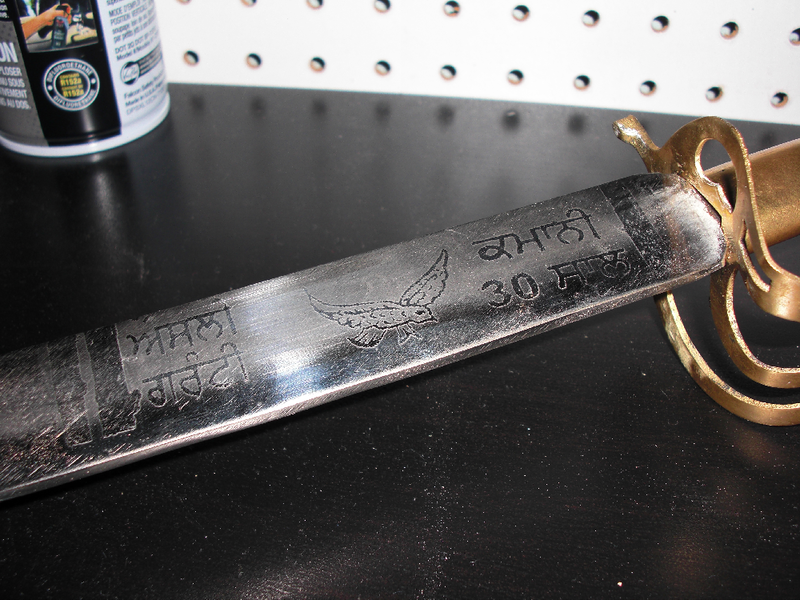 All I know is that the script on one side of the blade is Punjabi. I used to have one, with a Tulwar hilt, that had an identical scabbard ( Mine red velvet instead of blue but the same gold stitching ) and was basically a 1960's / 1970's touristy/souvenir sword. I think i bought mine in Montréal during the !967 World's Fair, " EXPO 67 ". One could also find these sold in Army Surplus type stores at the time as well as cheap Spanish swords of indifferent quality. 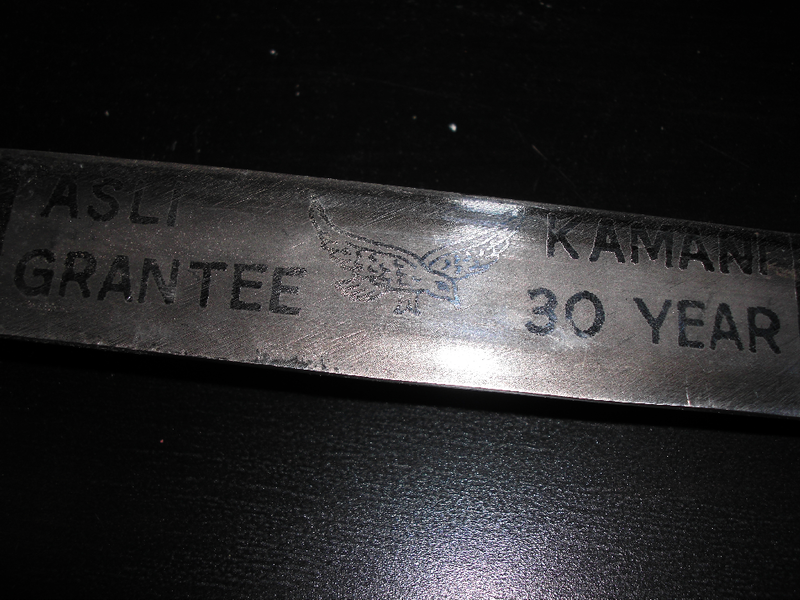 The blade had different markings looking more like some sort of Arabic script. Blade shape with the short false edge was exactly the same in profile. Assuming that I am correct it's a wallhanger reproduction and not an original. 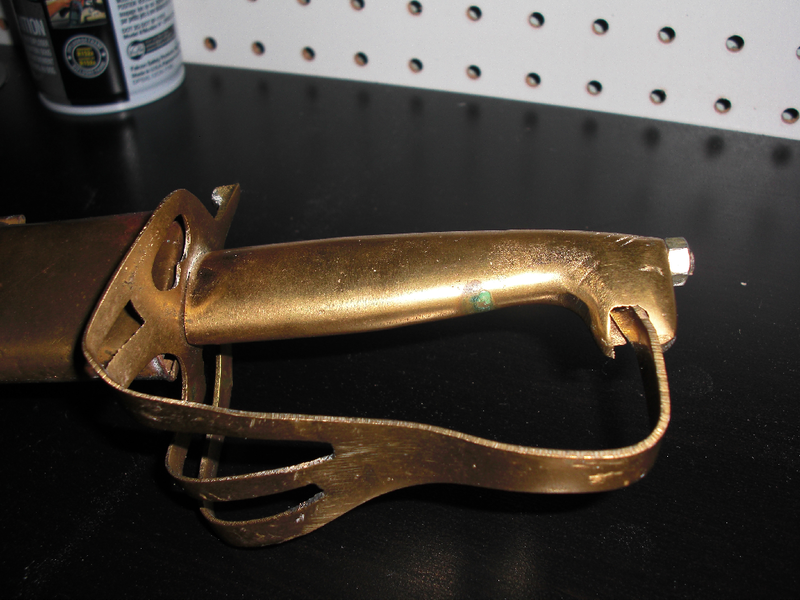 Not sure who made these but the odds are good that it's very early Windlass made in India or a similar Indian company. Thanks for the information, guys! I managed to pick this up at a garage sale five or six years ago for $1.50 CAD, but the guy selling it had no idea where it came from. In 1967 it probably cost around $25 but in those days earning $100 a week as considered a very good salary. Might have some " nostalgia value " as an early wallhanger example and be worth a little more today ? 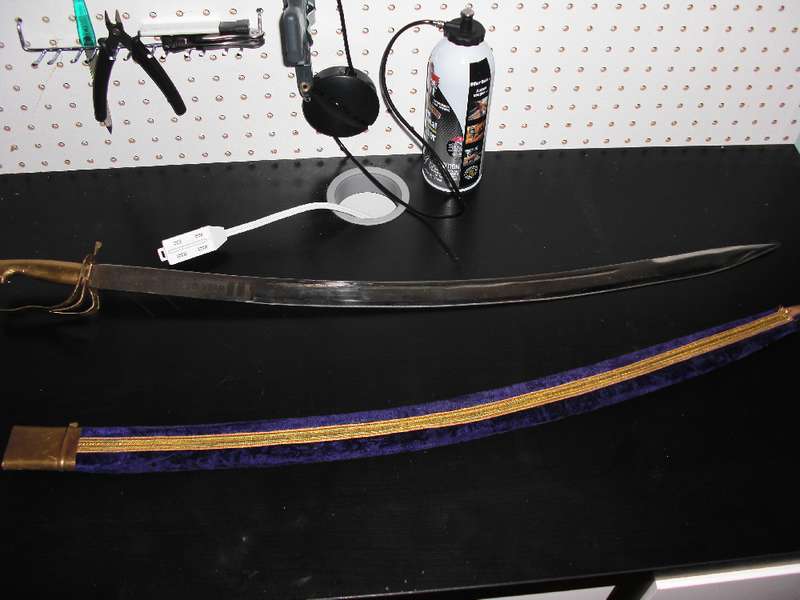 I know that seeing the scabbard brought back some good memories of how happy I was " initially " with buying mine, but even then I was sort of less happy with it when the low quality of the steel became evident. I think if it was even heat treated it must have been in the very low 40 r.c. range. In those days there wasn't much available unless one bought a real antique sword and most everything else one could buy was those really bad Spanish " decorator's "swords, so even these Indian made swords where better made. Oh, I also remember really low quality steel Kukris that where chrome or nickel plated ! One could find some nice original bayonets or turn of the Century or even older Civil War Sabres for $10 to $15 dollars in those Army surplus stores.